Google’s Project AndroidOne is running successfully since its inception. It’s debut device Xiaomi Mi A1 is being widely well received for the stock Android experience at an affordable budget. Also, Google is punctually rolling the security patches every month for it. Speaking of which, November security patch for Mi A1 is currently seeding across the globe. The update simply mentions bringing stabilization and optimization for the device. Unfortunately, the A1 users are not going to taste the Oreo with this patch. Maybe Google will gift wrap Android O for the Christmas in coming December. However, the current patch weighs around a little more than 1GB. Some users also have reported having received an OTA of 500 MB. Apart from that, we have also provided the firmware download link. You can manually download and install it to update to the latest security. Your device will automatically capture and install the update when it arrives. Well as it is dropping in batches it might not show up immediately. You can track down the same by manually checking for the patch update. Go to device Settings > About device > System updates. Check for latest software updates. If it is available, download and install the update. It’s really that simple. 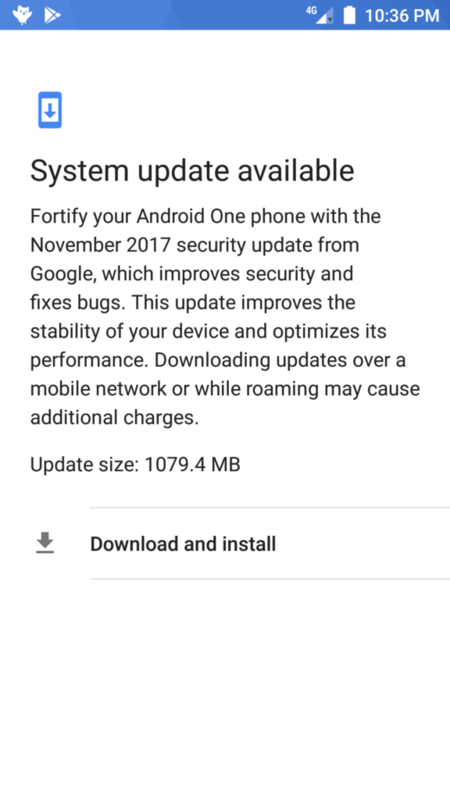 As mentioned earlier here is the direct download link for the latest firmware that steps up the security patch level of Mi A1 to November 2017. Now after you’re done with the download you have to install this update manually. Simply follow the link below to flash the firmware. So, grab the OTA or firmware whichever you like and update your device with latest security fixes. Keep scrolling on AndroidSage for all latest updates on November firmware updates for all Android devices.